COMP Cams offers Hi-Tech Pushrods for four different engine platforms that restrict oil flow. While the standard Hi-Tech Pushrods feature .100” oil holes, the oil restricting pushrod openings are half that size at .050”. 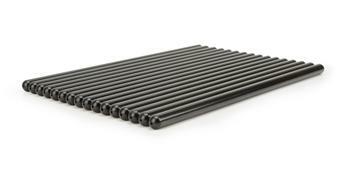 These pushrods are available for Ford 302c.i. Small Block engines as well as Ford 351c.i. Windsor engines, the classic Small Block Chevy engines and GM Gen III engines. For each engine platform COMP Cams® offers five different pushrod lengths to meet any need. These pushrods maintain the consistent Hi-Tech Pushrod features, including one-piece 4130 chromemoly material with a wall thickness of 0.080” and 60 Rockwell hardness. To avoid confusion, each oil restricted pushrod is clearly labeled.